*Pearl Thuston-Brown passed away Sunday. She was 84. Chuck Haddix interviewed the one-time vocalist in Lionel Hampton's band in 2007. She was last featured at Plastic Sax in 2010. *I didn't attend this year's gravesite service for Charlie Parker at Lincoln Cemetery. Neither, apparently, did you. In a report filed by my friend XO, he notes that just "(t)wo sax players, one singer and maybe a dozen observants" were present for the annual memorial. *Headline: Council approves 18th and Vine renovation project. KCJazzLark approves. *Tony's Kansas City gets the scoop on The Mutual Musicians Foundation's bottles of Kansas City wine. *Libby Hanssen compiled a survey of forthcoming jazz performances for The Star. *Here's a review of the first set of Marilyn Maye's current engagement at Jardine's. *Elgin Smith and Joel Francis reviewed Friday's Return to Forever concert. 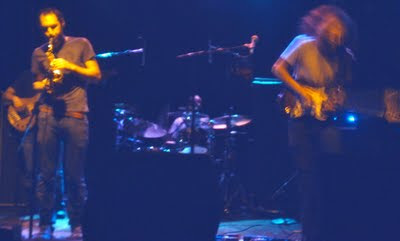 Here's a bit of fan footage. *"By modern jazz standards it was a complete hit and by free beer standards it was also good," Hunter Long writes of the most recent Black House Improvisors' Collective performance. Recent posts also include notification of the next season and a couple of video clips. *Ahmad Alaadeen's Dsyfunctional is now available as an e-book at Amazon's Kindle store. *Jeneé Osterheldt describes “Sweet Easy Sundays” at Danny's Big Easy. *The threat posed by Hurricane Irene forced the cancellation of the Charlie Parker Jazz Festival in New York. Here's a preview of what might have been. "(L)ike many musicians of my generation, bebop was like a message from the messiah," Toots Thielemans told The New York Post in advance of his ill-fated appearance at the festival. *Interesting background information about Dr. Reginald Buckner is included in the preview for the September 24 concert at the Blue Room featuring the Will Matthews Organ Quartet. *Here's solid audio (and murky video) of one of the Brad Leali Tentet's August gigs at the Blue Room. *From Community Christian Church: The lineup for the 2011 edition of Jazz Carol Fest includes Deborah Brown, Millie Edwards and Luzman Hamza. The house band features James Albright, Everette DeVan, Rod Fleeman, Stan Kessler, Jim Mair and Jurgen Welgen. Tim Whitmer is the Master of Ceremonies. The concert begins at 4 p.m.
*From the American Jazz Museum: A press conference regarding the 2011 Rhythm & Ribs festival is scheduled for 9:00 a.m., September 6, at the museum. "Where's 'Kid Charlemagne'?" a heckler shouted Thursday evening at Starlight Theater. "C'mon!" I was pleased when I first learned that Steely Dan had tapped Sam Yahel's organ trio to serve as its opening act for a portion of its current tour. I was eager to see if fans of a jazz-influenced classic rock band would be receptive to a genuine jazz artist. Alas, the answer is a resounding no. "Organ?" a guy near me grumbled. "It's like being at church." Rarely have I been so discouraged. 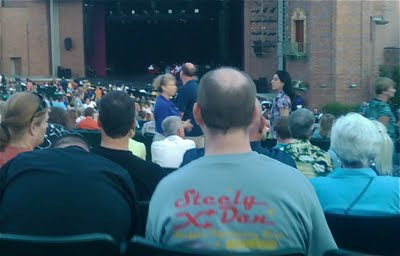 I'd long hoped that Steely Dan's aging audience would come to embrace jazz. I'd counted on that demographic- relatively affluent 40-to-60 year-olds with a taste for sophisticated pop music- to eventually acquire an active interest in jazz. The behavior of Thursday's audience indicated that my hope was little more than a naive pipe dream. Yahel and his colleagues- Adam Small on bass and Joe Strasser on drums- displayed an interesting array of concepts during their 30-minute set. Their smart and funky approach was closer in spirit to the music associated with Larry Young than Jimmy Smith. It didn't matter. The constant chatter of at least two-thirds of the early arriving audience of over 5,000 occasionally drowned out the trio. Revelers took selfies, socialized and shouted greetings to friends sitting several rows away. To be fair, very few of the concertgoers had heard of Yahel, nor did they expect an opening act of any kind. Asking a respected jazz act serve as an opener was an incredibly commendable move on Steely Dan's part. The noble experiment failed. My ongoing ambition of finding new ways to develop the audience for jazz took another hit. I suppose that any major dude could have told me. As Ron Burgundy might have suggested 37 years ago, these guys are kind of a big deal. The version of Return to Forever appearing at The Midland Theater on Friday, August 26, includes Stanley Clarke, Chick Corea, Frank Gambale, Jean-Luc Ponty and Lenny White. Zappa Plays Zappa opens. Here's Joe Klopus' preview. *Here's the complete lineup and schedule for the 2011 edition of the American Jazz Museum's Rhythm & Ribs Festival. The top two headliners at the October 8 event are the funk band War (the version that doesn't include core members Howard Scott, Lee Oskar, B.B. Dickerson and Harold Brown) and frail blues legend Bobby "Blue" Bland. Christian McBride & Inside Straight perform on the main stage at 5 p.m. Guitarist Charlie Hunter appears inside The Blue Room at 8 p.m. A set featuring trumpeter Greg Gisbert, saxophonist Rob Scheps and pianist Roger Wilder begins at the club at 10:30 p.m.
*Marilyn Maye kicks off a new week-long stint at Jardine's on Sunday, August 28. *"We as musicians have to take responsibility for bringing people to the music so it can have a chance," Hunter Long suggests in a stirring call to arms. "We have to stop acting like it's the club's job to provide us with an audience or that the government needs to have educated them 15 years ago so that they think we're relevant. We need to BE relevant." *Another chapter in Kansas City's jazz history is salvaged by KCJazzLark. *The Jazz District is subject to Kansas City's new curfew restrictions. *A recap of the Kauffman Center's opening night reminds readers that Diana Krall will appear and that "a 17-piece all-star big band led by Bobby Watson that will perform a commissioned suite honoring Kansas City jazz greats with the Kansas City Symphony. The jazz performance will include projections of images from the American Jazz Museum." *Ryan Heinlein is interviewed by Hunter Long. *The Topeka Jazz Workshop Band is examined by Bill Blankenship. *Andrew Ouelette, Lisa Henry and a trumpeter named "Herman Meharry" will perform in Hannibal, Missouri, on August 25. *I haven't seen a notification or discussion of this year's Charlie Parker gravesite memorial at Lincoln Cemetery, but in theory it will take place Sunday, August 28. Parker was born August 29, 1920, in Kansas City, Kansas. I don't care for Laura Chalk's voice. Yet I've discovered I can appreciate her new album All the Things You Are if I think of it as a Danny Embrey project. The guitarist's low-key brilliance is consistently astonishing. The reassuring presence of Kansas City mainstream jazz stalwarts Paul Smith, Bob Bowman, Tim Cambron and Steve Hall also make the session worthwhile. Young saxophonist Matt Chalk, the son of the vocalist, appears on three tracks. Not everyone shares my particular bias. 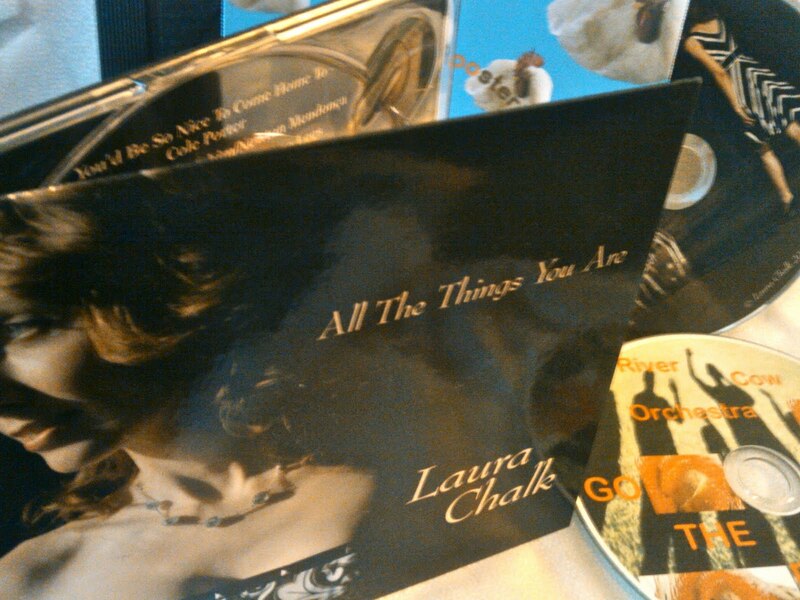 Read a very favorable review of All the Things You Are here. Jacob Fred Jazz Odyssey was formed in Tulsa in 1994 and has issued over twenty albums. The band's extensive history makes the suggestion that Race Riot Suite is an important, career-defining album seem entirely daft. Yet the ambitious project will doubtless inspire lots of breathless hyperbole from advocates of the sprawling sound associated with Charles Mingus and Henry Threadgill when it's released on August 30. The wildly entertaining suite was written and arranged by pedal steel player Chris Combs, but its most distinctive sonic characteristic is the all-star horn section of Peter Apfelbaum (baritone saxophone), Steven Bernstein (trumpet, slide trumpet), Jeff Coffin (tenor saxophone), Matt Leland (trombone) and Mark Southerland (tenor saxophone, homemade horns). A recent live performance of "Black Wall Street" encapsulates the project's sensibility. Kansas City-based bassist Jeff Harshbarger solos at the 9:10 mark. Race Riot Suite isn't merely a serious contender for album-of-the-year. It's one of the most compelling jazz-based albums of the new millennium. A quick inspection of ReverbNation's "Top Jazz Artists" chart for Kansas City reveals an anomaly. River Cow Orchestra is the number one act, a distinction it's held for a long time. River Cow Orchestra's ability to game the system doesn't faze me. The fact that it markets itself as a jazz act, however, is misleading. Primarily an instrumental, improvisational-based band, River Cow Orchestra is more inspired by Ummagumma-era Pink Floyd than Charlie Parker. Even though its members have clearly studied the electric work of Miles Davis, River Cow Orchestra doesn't swing. Its occasional melding of Santana and Lonnie Liston Smith along with its affinity for absurdism makes the new album Go Wake the Rooster ideal music for a hookah bar. Here's one of 537 videos the band has uploaded to YouTube. I've never agreed with the sentiment behind "It Don't Mean a Thing (If It Ain't Got That Swing)." River Cow Orchestra is really good at what it does. But what it does isn't jazz. The big brother of my best friend had a jazz fusion/prog rock/metal band when I was a little kid. We'd watch them rehearse in a suburban basement on weekends. I was more impressed by the ancillary presence of girls, drugs and strobe lights than by the pretentious music. The pale imitations of Brand X, King Crimson, Tony Williams and the Scorpions must have have had an impact on me, however, because I get giddy when a contemporary band like Marbin displays some of those influences. Marbin performs at The Record Bar on Sunday, August 21. Paul Wertico, Steve Rodby and Jamey Haddad sometimes work with Marbin, but here's the word on Sunday's show from Jeff Harshbarger: The lineup will be Dani Rabin (gtr) Danny Markovich (sax) Ian Stewart (bass) and Justyn Lawrence (drums). The likely absence of girls, drugs and strobe lights won't keep me away. *Tim Finn praises Kansas City's homegrown talent in an excellent essay. Karrin Allyson, Mike Dillon, Jeff Harshbarger, Hearts of Darkness and Krystle Warren are mentioned in Finn's piece, but that's obviously just a small fraction of the area's jazz and jazz-related talent. In the spirit of Finn's piece, I'll suggest that infrequent Plastic Sax readers shouldn't hesitate to catch international stars like Joe Lovano and Christian McBride when they come to town, but they should also know that the Kansas City Jazz Calendar is loaded with listings for performances by some of the world's best jazz musicians. *Recipients of The Pitch's 2011 music awards included Heart of Darkness, "Best Jazz Ensemble," and Mark Lowrey, "Best Jazz Solo Artist." *The largely forgotten career of Blind Boone is revisited by KCUR's KC Currents. *Megan Birdsall's ongoing medical problems are summarized by KCJazzLark. *This year's Charlie Parker Jazz Festival includes appearances by Toots Thielmans, James Carter, the Archie Shepp Quartet and Anat Cohen. As thousands of New Yorkers celebrate jazz royalty in Tompkins Square Park, a few dozen Kansas Citians will congregate for a graveside service at Lincoln Cemetery. *Chris Burnett is the interim Marketing/Communications Manager at the American Jazz Musuem. *A Logan Richardson gig in London is reviewed by The Financial Times. *The forthcoming We Always Swing season in Columbia, Missouri, is very impressive. *The new owner of Overland Park's Intentions promises that her venue will feature live jazz two nights a week. *Mary Lou Williams: The Next 100 Years, a new album by the New York-based Virginia Mayhew Quartet, was released yesterday. *Here's a set of video uploads from last weekend's gig at Davey's featuring Alaturka and Malachy Papers. *Additional video from the recent Black On Both Sides event at the Blue Room was recently uploaded to YouTube. *St. Louis Jazz Notes reports that Joe McPhee, Matthew Shipp and John Hollenbeck's Claudia Quartet are among the acts scheduled to perform in the 2011-12 season of St. Louis' New Music Circle. *Chicago-based critic Howard Reich reviews a Charlie Parker-inspired performance by Donald Harrison, Jr.
*Tweet o' the Week: thesoundkc: Hosting a late night, multi-genre PARTY!!!!!!! on Saturday, August 27th at the Firehouse on Troost! Great DJs and bands lined up. No cover!!! *From Jim Mair: WHAT: The Kansas City High School All Star Jazz Ensemble. WHO: The best of the best from both sides of the state line. 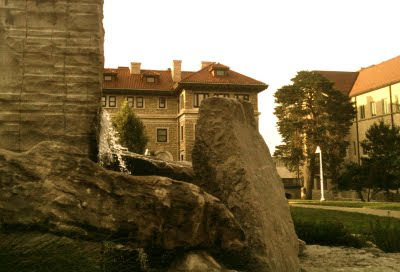 WHEN: For ten weeks beginning Wednesday August 7 from 6:30 to 9:30pm WHERE: ...Kansas City Kansas Community College. COST: $90. Director: Hermon Mehari... Please have any interested students contact Jim Mair 913-288-7149. 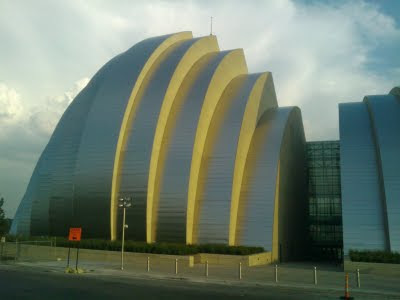 *From Jim Mair: The 2012 edition of "The Kansas City Jazz Summit" will be held April 25-27. In short, The Kansas City Jazz Summit will cater to Middle School and High School Jazz Bands, Jazz Combos and Jazz Choirs. We will have three categories and three performance sites all at KCKCC. More information is available here. A knowledgeable friend doesn't share my enthusiasm for the American Jazz Museum's bookings for the 2011-12 Jammin' at the Gem season. Most of the artists, he notes, regularly perform in Kansas City. That may be true, but I don't mind repetition when musicians are of this caliber. The only truly disappointing aspect of the new season is the apparent reduction of the series from six to five concerts. Will she or won't she? Esperanza Spalding was a no-show at Joe Lovano's May 7 concert at the Folly Theater. I absolutely adore the woman I call "The Future," but her presence won't make or break this gig. Lovano's spring concert was one of my favorite shows of the year and his current Bird Songs release is guaranteed a spot in my year-end top album list. I don't get it. Geri Allen is a left-leaning pianist. Tierney Sutton is a mainstream vocalist. The only thing the two jazz artists have in common is their gender. I regularly lobby for more jazz double bills, but this combination is just plain odd. Most members of the audience will probably enjoy either Allen or Sutton but not both. Stefon Harris, as I like to say, "gets it." He understands that jazz doesn't exist in a vacuum. Blackout's funk-oriented 2010 concert at White Recital Hall was truly exciting. While I don't ordinarily comment on hypothetical engagements, it's not a slight on Blackout to suggest that Harris' new Ninety Miles project would have represented an even more intriguing booking. Ramsey Lewis' acoustic trio concert at the Jammin' at the Gem series in 2006 was very nice. This outing will be completely different. A collaboration between Lewis and Earth, Wind & Fire, the disco-inflected 1974 album Sun Goddess is a personal favorite. Lewis talks about revisiting the project during the forthcoming tour here. I conducted similar exercises for previous Jammin' at the Gem seasons: 2010-11, 2009-10 and 2008-09. A seemingly unlikely jazz-related double bill takes place Friday, August 12, at Davey's Uptown Rambler's Club. Alaturka, the exquisitely tasteful Turkish jazz ensemble led by thoughtful multi-instrumentalist Beau Bledsoe performs with Malachy Papers, an in-your-face ensemble that features Mike Dillon and Mark Southerland. Relatively conservative jazz fans are tossed a lifeline in the embedded video when a Monk composition kicks in at the 4:25 mark. "Misterioso" indeed. *KCJazzLark reflects on the second anniversary of his excellent Kansas City jazz blog. *Mike Dillon is interviewed by Tim Finn. *Peter Witte, the dean of the University of Missouri-Kansas City’s Conservatory of Music and Dance, proposes "the creation of a UMKC performing arts campus"
*Pat Metheny was featured by the BBC yesterday. *Black House Improvisors' Collective offers an update about its August 19 performance. *Bassist Ron Roberts has published an e-book. *An event titled Jazz by the River takes place August 21 in Leavenworth. A few details are here. *A Rufus Reid-led gig featuring Bobby Watson was reviewed by The New York Times. *Tweet o' the Week: Clint Ashlock: I know this is documented, but I'll say it again. I freaking love Stevie Wonder. *Consumer tip: Today' deal at Muncharoo is a half-off deal on 2011-12 season tickets to New Ear. *From Michael Shults: On August 19th the drummer Matt Kane is coming back to KC to play at Take Five with Clint Ashlock, Andrew Ouellette, Seth Lee, and me. Matt was a stalwart on the KC scene in the 90's before moving to NYC. He played with all the KC heavies while he was here and hasn't been back in 7 years. *Spotted at Starlight Theater's site regarding the August 25 concert by Steely Dan: Acclaimed jazz artist Sam Yahel is on board as the tour's main support act. *From Mark Lowrey: Thursday August 11th, I have the opportunity to play a solo piano concert at the Living Room Theater (1818 Mcgee). The sole purpose of the concert is to raise money for water.org. 100% of ticket and CD sales go to the cause. Water.org is a fantastic charity that helps provide sustainable solutions to the global water crisis… Doors to this event open at 7:15pm, with a concert at 8. Cover charge is a minimum of $5. Bring more! *From Doug Talley: The Doug Talley Quartet will be performing The Kansas City Suite -- an original 10-movement composition, recorded in 2001 -- at the Kansas City Museum this Friday, August 12, 7:00pm. Weather permitting, we will be on the north lawn. Join us for "Pendergast," Stockyard Blues," "Shuttlecocks," "The Buck Stops Here," and much more! The concert is FREE and open to the public! A few readers of Plastic Sax know that the author of this blog frequently attends performances of music other than jazz. 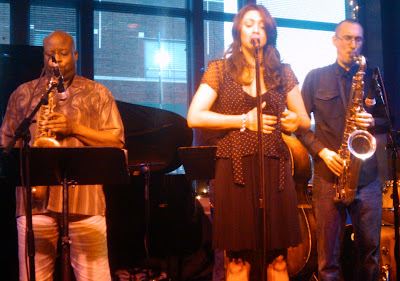 Just half of the six events I caught last week- Tim Whitmer's July Jazz Jam (reviewed here), Phonologotronic at Fishtank Performance Studio and Dan Gailey with a Tim Doherty-led band at Intentions (photo here)- were jazz-related. I caught myself thinking about jazz at the other shows I attended. I wondered, for example, what members of each audience might be willing to attend a jazz performance. The results of my brief surveys varied each day, of course, but I didn't spot many potential takers. With the notable exceptions of the realms of (some) jam bands and (some) hip hop, the gulf between jazz and popular music continues to grow. The division is about more than music. Today's audiences expect to experience multi-media presentations. Technological advances allow for greater spectacles than ever. Setting the musical chasm aside, how is the guy in the foreground of the accompanying image taken at a rock concert last night going to respond to a visually static jazz show? I can't imagine him sitting still for a recital by Keith Jarrett. To be sure, most intimate club performances by artists of every genre don't offer sensory overload. But if jazz musicians and jazz presenters intend to recapture larger audiences, they're going to need to recognize that the rules of the game have changed. Rather than seeing this new challenge as an insurmountable obstacle, the jazz community might view the chance to get ahead of the curve as an exciting opportunity. While the DMS name doesn't work for me, I'm rather partial to everything else about the combination of George Duke, Marcus Miller and David Sanborn. If I'm going to listen to so-called smooth jazz, I'd like it to come from these guys. They perform together Monday at The Uptown Theater. *The 2011-12 season of the Topeka Jazz Workshop includes Kenny Barron and Sara Gazarek. *Hard feelings and ill will are aired out in a fascinating update on the Prairie Village Jazz Festival. *Hearne Christopher reports that the 12th Street Jump radio show will move from the downtown Marriott to Jardine's. *Ernie Andrews' recent appearance at The Blue Room is documented by KCJazzLark. It's another amazing post by the jazz blogger. *Pat Metheny is featured in an intriguing episode of Echoes. *"I was overjoyed and impressed by River Cow Orchestra's performance," Nihan Yesil raves at KC Metropolis. "It was one of the best spontaneous musical creations I experienced." *A show preview New York Times calls Logan Richardson's sound "intricate but untroubled." *Peter Hum calls Steve Cardenas' most recent album "earthy, funky and sophisticated all at once." Read the full review here. *A critic in Seattle raves about Karrin Allyson. *The Star offers a nice feature about an initiative for "youth community instrumental programs." *Gene McDaniels has died. He was born in Kansas City in 1935. *The contentious comments following Monday's post is worth a look. 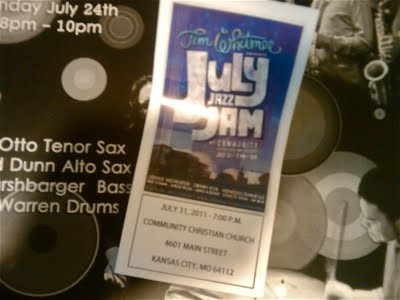 *The Kansas City Jazz Calendar has been updated for August. *Consumer tip: Today's KC-area Groupon is a 52% discount on a ticket to the George Duke, Marcus Miller, and David Sanborn concert at the Uptown Theater on August 8. *Tweet o' the Week: bandcalledmouth: Yo! We just thought we would share a SAMPLE of the video we're working on with Fenton Design Studio. *From a press release: Every 3rd Sunday of the month, Hidden In Christ Ministries… celebrates the Sabbath with a Gospel Jazz Buffet. The event, which is open to the public, is held in the Trade Winds Restaurant at the Holiday Inn, 9103 E. 39th Street, Kansas City, Missouri 64133. 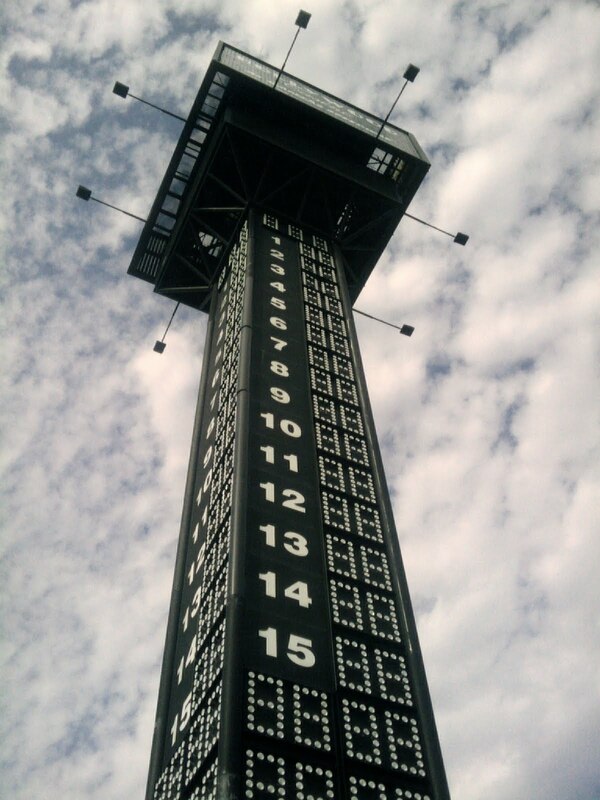 The hotel is located near Interstate 70 and Interstate 435 across the street from the Truman Sports Complex. The cost for food, fun and music is $15 for adults and $10 for children. *From Black House Improvisors' Collective: The Black House Improvisors' collective will be concluding its second year and eighth new music workshop with its most ambitious performance to date. With the help of fellow Charlotte Street resident, Christina Dostaler, Black House is taking over the La Esquina art space on Friday, August 19. The show will begin at 7:00 p.m. and admission is free. In continuing with its mission to promote new Kansas City music, Black House will be featuring three of this workshop's participants' own groups. (Hominid Quartet, Project H and Phonologotronic.) 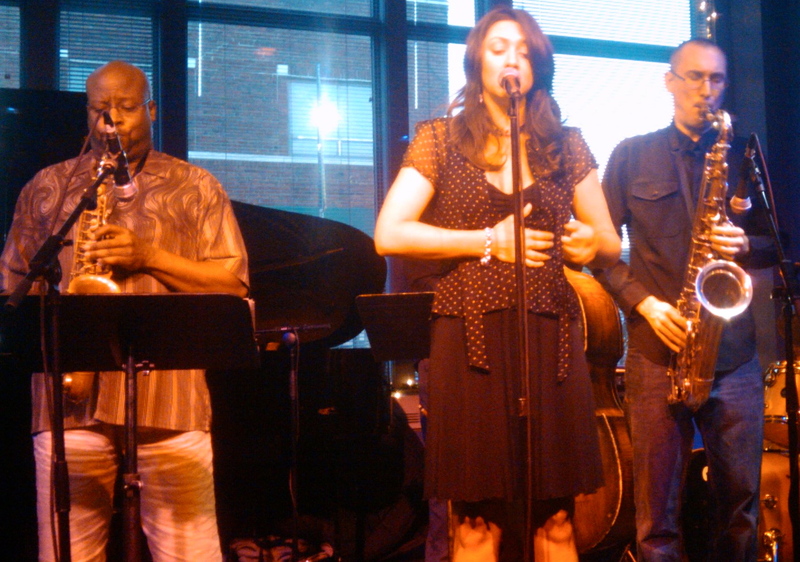 These groups represent the new directions that jazz is taking in Kansas City. Each group will play a short twenty minute set before the BHIC performs at 8:25 p.m.
"I hate 'happy jazz,'" a young jazz musician commented at Plastic Sax a few months ago. If he was referencing the approach associated with Tim Whitmer, he holds the minority opinion. The popular entertainer has been a favorite of Kansas City audiences for decades. They came out in droves to attend Whitmer's latest venture on Sunday evening. The (first annual) July Jazz Jam at Community Christian Church attracted approximately 750 people. Whitmer regularly proves that there's still a sizable audience for mainstream jazz when it comes in the form of familiar material played by musicians with smiles on their faces. The gentle sound heard Sunday may have been safe, but it was also impeccable. James Albright (bass), Everette DeVan (organ), Rod Fleeman (guitar), Jim Mair (saxophone) and Jurgen Welge (drums) served as the indefatigably swinging house band at "Club 4601." I've attended S.R.O. Whitmer-led Christmas concerts at Community Christian Church for years, but I didn't expect the same sort of enormous turnout for a first-time event on a balmy Sunday night in July. Shows what I know. If anyone has ever been inclined to say "I told you so," well, now's the time.